At first glance, I thought the only member of the all-time Red Sox roster to celebrate a birthday on June 9 might have had an identity problem. His real name was Dominic Joseph Ryba, but everyone knew him as Mike. He won a minor league batting title as an all star catcher in 1933 and two seasons later, he was a 20-game-winning pitcher. That’s when the Cardinals brought him up for his big league debut at the end of the ’35 season. Ryba was already 32-years-old by then and he spent the next five years bouncing up and down between St Louis and the clubs top farm teams. In 1940, he went 24-8 for the Cardinals double A affiliate in Rochester, NY. Even though he was 37 years-old by then, the Red Sox traded for him that September and he spent the next six seasons, including all of the WWII years pitching mostly in relief for Boston. He did pretty well. 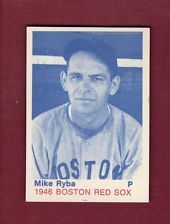 Overall, Ryba went 36-25 in Beantown, including an impressive 12-7 1944 season. In 1945 he compiled a career low 2.49 ERA. The right-handed native of DeLancey, PA also got all of his 16 career saves while wearing a Red Sox uniform. By the time all of the big league players returned from service in the War, Ryba was 43-years-old and ready for his next career as a minor league coach and big league scout. He died in 1971 at the age of 68.